Before we had children, my husband an I used to travel quite frequently. Most people think of romantic, sunny beaches when they think of traveling; we have always enjoyed visiting cities. There’s just something about the vibrancy of cities that has always appealed to us. As we started adding children, we realized that traveling can be quite the undertaking, never mind traveling to cities! We really didn’t want to give up traveling, so as our family has grown, we have learned how to be creative and frugal with our traveling. One of the main things we have done is research the hotels that are especially family friendly. We look for hotel rooms with ample space and full kitchens, and hotels with added amenities and features. Most hotels offer rooms that can accommodate four people, but when you have more people than that in your family, traveling can be difficult! 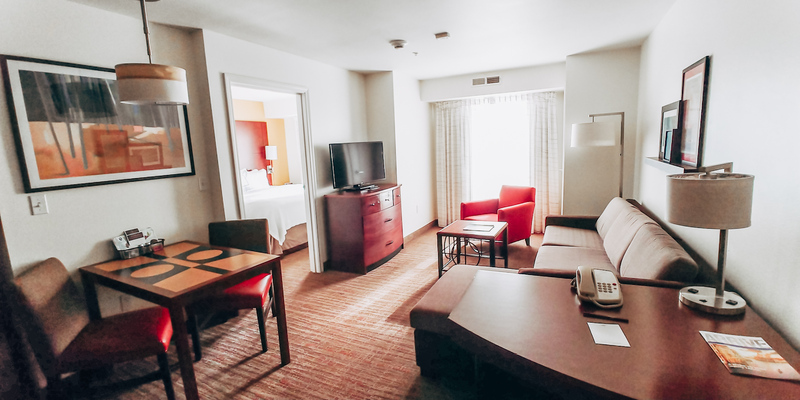 One of our absolute favorite family friendly hotels is The Residence Inn by Marriot. We have stayed at many hotels over the years and when given the chance, we always choose The Residence Inn; it just can’t be beat. Recently, we stayed at The Residence Inn Providence and once again, were blown away at the hospitality and convenience of this hotel. We were greeted at the front desk with pleasant conversation and even had the chance to meet the General Manager, Curtis. He assured us that the staff was there to help us with whatever we needed during our stay. As a busy mom of many, this instantly put my mind at ease; because, really – what mom hasn’t forgotten to pack a toothbrush or a razor!? Like most of The Residence Inn hotels, this particular hotel in Rhode Island has beautiful landscaping, with a basketball court and an outside patio area for grilling. There is even a little dog park! Inside the hotel there is a pool and a whirlpool spa, a fitness center, and a laundry room. There is also a big breakfast room with plenty of tables and seating. The Residence Inn offers a hot and cold breakfast for your family each morning, and nightly socials during select nights of the week. The rooms at The Residence Inn are perfect for families, even when you have a larger family like we do! 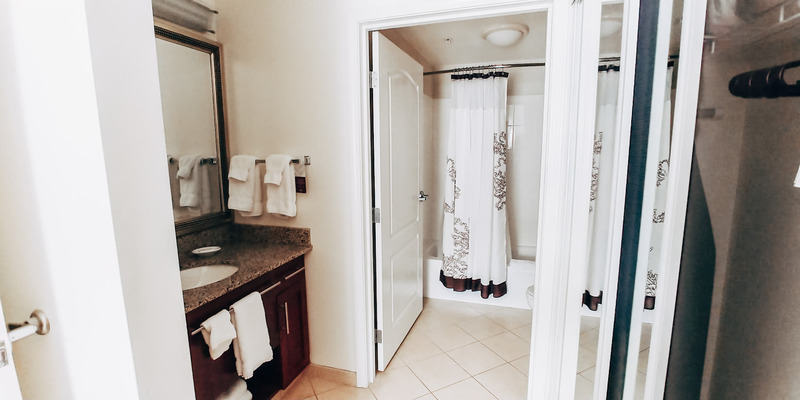 You can choose a two bedroom suite if you wish, but even the studio suites and one bedroom suites offer ample space for families. Our suite was the studio suite, which still has over 400 feet of living space. When you’ve been traveling in an RV for awhile, this feels incredibly spacious! Our kids were almost bouncing off the walls when we arrived in the room. Each suite has a full pull out sofa and plenty of storage, which comes in very handy when you have packed for a large family trip! I also appreciate all the table surfaces; we have had to take schoolwork with us on occasion, so this is very helpful. One of my necessities when staying in a hotel is some sort of kitchen in the room. 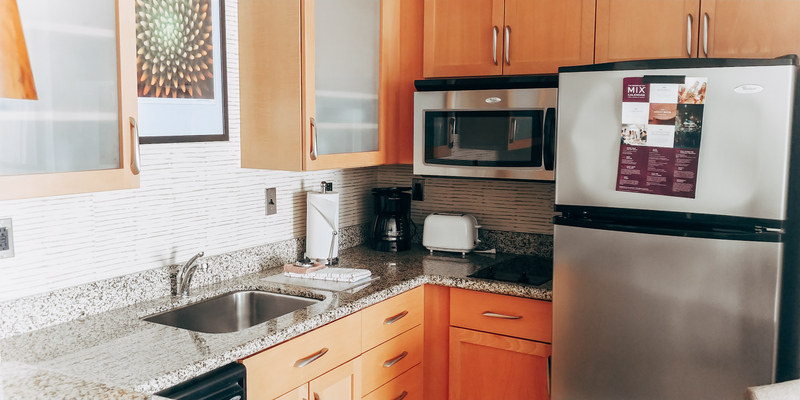 The Residence Inn suites have full in-suite kitchens, complete with a full fridge and dishwasher. They even include the less thought of things, like a can opener and cutting board. Having a full kitchen helps us save so much money when we go away. For the price of one restaurant meal, we can cook for multiple days in the hotel room. This means we can save money for family activities to enjoy in the city. I would much rather spend money making memories on a fun family activity than on a meal! After our kids had the obligatory ‘jumping on beds dance’, we were all able to rest comfortably with lush bedding. My husband said I didn’t even wake up when the baby was crawling all over me! Oops! I don’t know about your family, but my kids have to take baths when we stay at a hotel. The little ones bring their waterproof toys and stay in until their toes get wrinkled. I can’t say much, because I am a huge fan of the shower heads at The Residence Inn! There’s just something about taking a hotel shower! My children think it’s so fun to look at all the reflections in the mirrors! The large closet doors are mirrored as well, so their reflections go on forever. The Residence Inn serves a hot and cold breakfast each morning, which is included in your stay. This is a huge blessing when traveling with a family! The breakfast at The Residence Inn is a favorite of ours! 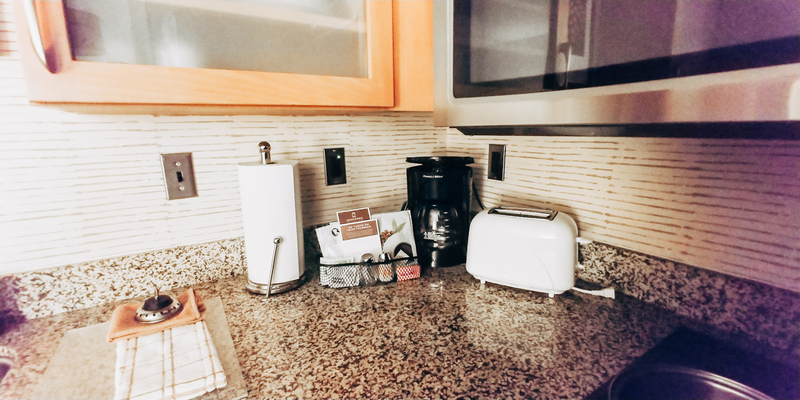 This is not a continental breakfast – you have your choice of fruits, cheeses, cereals, breads, bagels, muffins, pastries, meats, yogurts, topping galore (my kids call the nutella, “hotella” because they only get it here! ), and more. At many hotels, I can’t eat the breakfast because I follow a keto diet, but I can eat until my heart’s content here. On Monday, Tuesday, and Wednesday evenings, The Residence Inn offers a complimentary social for guests. We stayed on a Monday night and enjoyed beer, wine, fruit and spinach dip. They also have fabulous coffee (I like the dark roast) available all day and night, which is a must in my book! 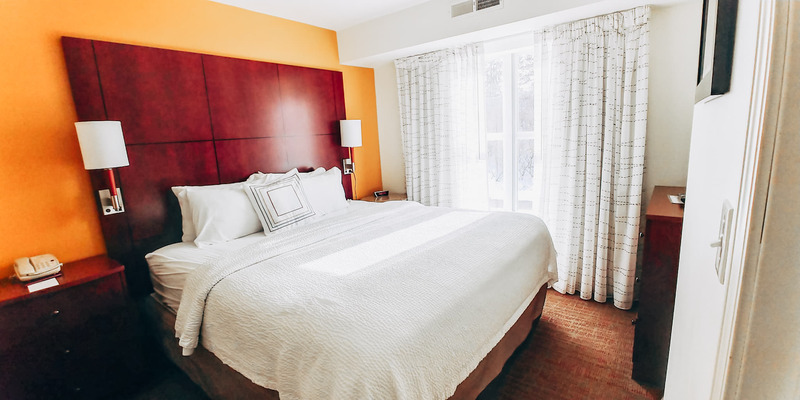 As you can clearly see, if you are looking for a family friendly hotel that goes above and beyond for guests, consider staying at The Residence Inn. We stayed at the Providence location here, but they have locations throughout the country. My children keep asking if we can live there! That tells you how at home they feel every time we visit! Thank you to The Residence Inn for making our family feel at home. WHAT DO YOU LOOK FOR IN A FAMILY FRIENDLY HOTEL? Love how it can accommodate everyone. This one looks so nice and updated. I have never stayed at a Residence Inn. But, I also try to make sure when traveling we can get a spacious room and a complimentary breakfast. I only have 3 kiddos but making sure I can get those two things makes traveling so much more pleasant. I will have to remember to check for a Residence Inn the next time we travel! Wow, what a nice place to stay! The rooms look very comfy, clean, and spacious. When looking for a family room, having a kitchen is always a plus. Also, having a nice breakfast every morning is a nice way to begin your day. I have stayed the night in many, many hotels, but I do not ever recall visiting the Residence Inn. I have visited other Marriott hotels, and they are always very accommodating and nice. My children love spending the night at hotels as well, and an indoor pool is always a super fun treat for our family. 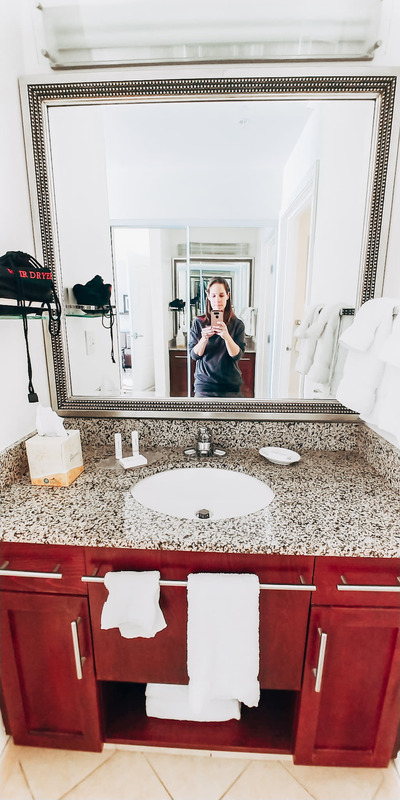 Sparkling clean bathrooms and fresh sheets are also on the top of my list, and a complimentary breakfast is definitely needed when traveling with a family. 😉 Thanks for this great review! I had no idea Residence Inn offered suites! That is so perfect for families with little ones! Add in the fact that they actually have dark roast coffee and I’m sold! Every time we travel we always choose Marriott. No matter where in the country we are. We actually just booked one to stay at the night before our family cruise.